Collecting Asylum: Asylum Reviews; Nidhogg 2 [Xbox One]. Nidhogg 2 is finally out on Xbox One, bringing us all of the gameplay we know and love from the original, but with a whole load of new tricks up its sleeve. And with two brand new, exclusive levels you've got even more reason to try it out if you haven't already. Some people felt that the first game was too basic: you went head to head with another player and using your fencing sword - otherwise known as a rapier, would battle it out very similarly to what we have on offer here. But with a single weapon, people felt it needed more. So that's what we got: you now begin each level (and after each death) with either your rapier, a broadsword, a dagger, or a bow and arrow, each with their own pros and cons. All can be tossed at your enemy, as an extra way of utilising them, but once you've tossed it, you then need to roll over another weapon otherwise you'll remain unarmed (and vulnerable) - but don't worry - you can always stomp the opponent to death if you have to! First of all, we have Arcade Mode where the aim is to get to your side of the scrolling-screen the fastest when up against your enemy. You can fire arrows at them, stab them or chop them with your sword (or throw any of your weapons at them), in order to slow them down, allowing you to run past to advance further to your winning side. Or, you could just jump over them and force them to chase you! 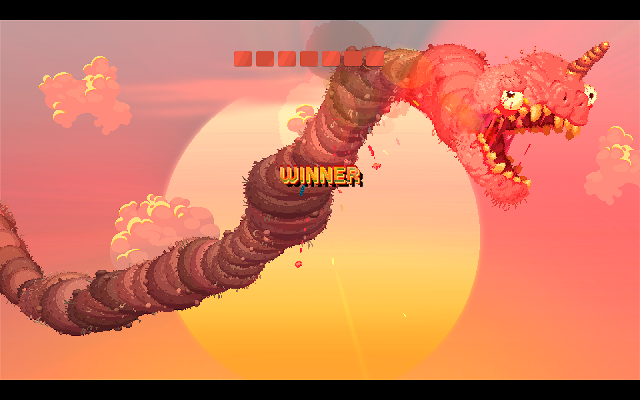 There are small boxes along the top of the screen that fill as you progress towards either your side, or the opponent's, where ultimately the winner will be gobbled up by the fabled Nidhogg, a huge grotesque worm. Playing the game alone is fun, but nothing extra special. Two-player is where it really shines. Playing up against a real-life opponent with some couch co-op is the best part of Nidhogg 2. Screaming in frustration as your friend takes you down repeatedly, making it look like child's play to win, meanwhile you can't even advance a single screen on your side. A single game can vary from being just a couple minutes in length, all the way up to the double digits. It's a frustrating, yet satisfying back and forth between the two players, as you try to one-up and out smart each other. We got the wee man involved and he instantly fell in love with the game. The challenge of going up against someone in such a fast paced environment, and with such a simple premise to the game, he was hooked. It also has a lot more replayability as a co-op game, since you can continue to challenge other friends and family, whereas in Single Player it can be beaten in as little as an hour - leaving you no real need to ever go back aside for multiplayer. There's also an even more chaotic Tournament mode, which allows up to eight players to face off. Cheats can also be utilised, adding another fun layer to the game - you can choose to set it to low gravity, or limit what weapons can be used or even add a timer to make it more of a panic to get to your side before the time is up. And of course, I can't exactly review this without mentioning the graphics. 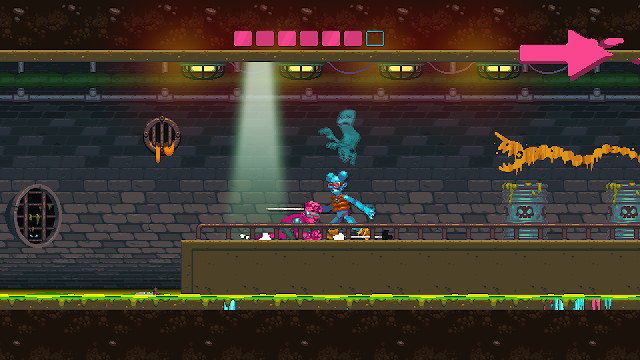 Vastly different from the original Nidhogg, Nidhogg 2 ditches the simple pixel sprites from before for bulging lumps of brightly coloured flesh. The backgrounds and environments have taken a turn for the gross as well, with some people feeling disappointed in the new look. Frankly, we found the new look to be quite fitting with the humour of the game and feel that it wouldn't quite be the same without these disgustingly hilarious characters. The settings are varied and interesting to look at and the soundtrack is also fantastic, fitting really well with the game. 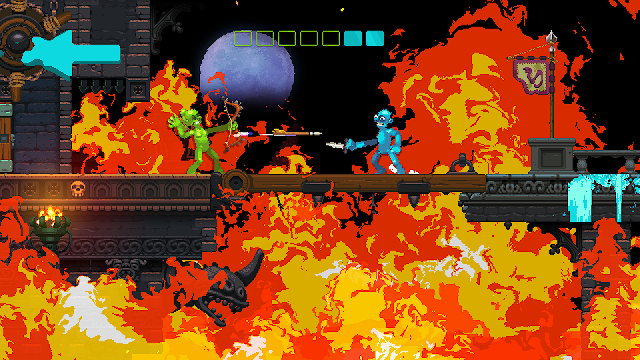 Have you played Nidhogg 2? What did you think of it?